NH Grand Place Arenberg offers an ideal location in the historical and commercial centre of Brussels. The famous Grand Place and the Central station, with local and international lines, are within a five-minute walk from the hotel. The Parc de Bruxelles (Waranderpark) with the Royal Palace and the museum of Belgium’s master of surrealism, Rene Magritte, is 10 minutes from the hotel. Rates available for reservations from 16 - 25 June, 2010. Rate inclusive of breakfast, services, taxes and VAT per night, per room. Reservations must be booked by 30 April, 2010. Any reservation received after 30 April, 2010 will be based upon request and availability. The superior 4 star NH Hotel du Grand Sablon is ideally located in one of the most beautiful squares in the heart of Brussels. The Sablon district provides a fantastic atmosphere all year round, thanks to the numerous antique shops and art galleries that are located there. In addition, the world-renowned weekend antique market held at the Place du Grand Sablon, is only a short walk away from the hotel. Rates available for reservations from 20 - 25 June, 2010. Rate is inclusive of breakfast, services, taxes and VAT per night, per room. Any reservation received after 30 April, 2010 will be based upon request and availability. 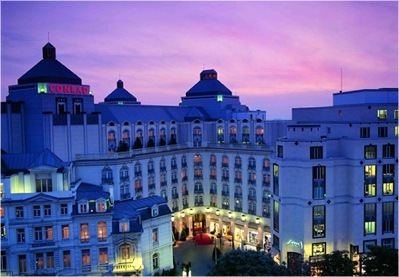 The newly refurbished Hotel Amigo, which has been restored to its rightful status as the best luxury hotel in Brussels. Superbly located in the very heart of Brussels, adjacent to one of the most beautiful squares in Europe, Grand Place, close to Brussels' financial district and within easy walking distance of the antiques district of Le Sablon, Hotel Amigo now provides a stylish and central base from which to explore the city. Rates available for reservations from 19 - 24 June, 2010. Rates are inclusive service, taxes, VAT, and 24-hour Internet. The Hilton Brussels will be the perfect location for your stay in the Belgian Capital. 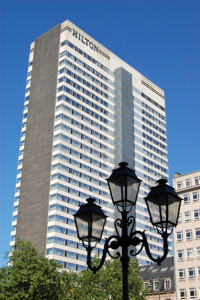 Located in the city center, the Hilton Brussels is only at 10 minutes by walk from Le Square where the ICANN event will take place. 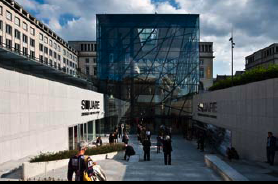 To reach the conference center, you will walk through the Egmont Park, Sablon District and Place Royale area! Rates available for reservations from 18 - 27 June, 2010. The Conrad Brussels luxury hotel in Brussels, Belgium is located on the legendary and highly fashionable Avenue Louise, offering exceptionally stylish accommodation in sophisticated surroundings. The main tourist attractions, stations and most elegant boutiques in Brussels are all within easy reach of our Brussels, Belgium hotel. Rates available for reservations from 16 - 30 June, 2010.